The FY 2016 appropriations bill covering spending for Transportation, Housing and Urban Development, and Related Agencies (THUD) is headed to the full House for debate this week. 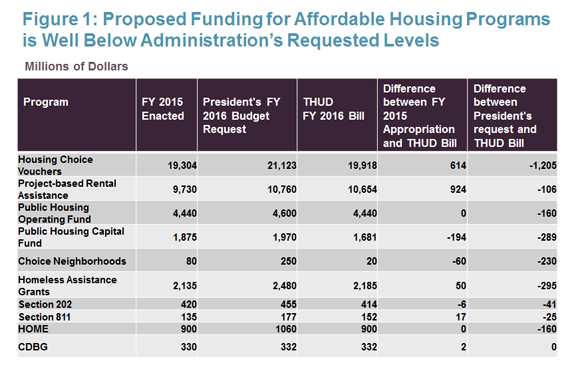 Approved on May 13 by the House Appropriations Committee on a party-line vote, the FY 2016 bill provides $42 billion for HUD, which is $1 billion above the FY 2015 enacted level but still $3 billion below the amount requested in the President’s budget. Due to the Congressional Budget Office’s projection of a $1.1 billion decline in revenue from FHA insurance premiums in FY 2016 and a shift to a calendar-year funding cycle for the project-based rental assistance program, HUD had required an increase of about $3 billion in FY 2016 just to maintain rental assistance for the millions of families that currently receive it. 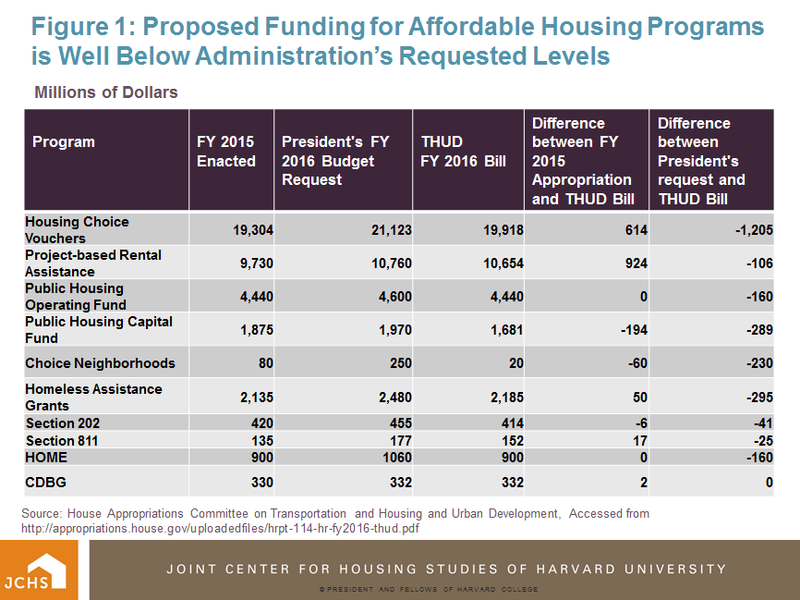 However, the bill has approved funding for rental housing assistance programs that are well below levels requested in the President’s budget (Figure 1). The proposed funding level for HUD programs in the appropriations bill reflects the continuing impact of spending caps on non-defense discretionary programs that had been established as part of the 2011 Budget Control Act. As OMB Secretary Shaun Donovan points out, real budgeted discretionary spending (referring to programs that are funded on an annual basis and exclude entitlements such as Medicaid and Social Security) now stands at its lowest level in a decade. The THUD bill slashed funding for the public housing capital repairs program by nearly $200 million from the FY 2015 appropriation. Furthermore, despite a 3 percent funding increase over the FY 2015 level for housing choice vouchers, this increase does not restore the 67,000 vouchers lost to sequestration in 2013 and the amount allocated for renewals falls nearly $183 million short of the amount that HUD estimated it would need for renewing assistance for all current voucher holders in FY 2016. Furthermore, of concern for many affordable housing advocates is the proposed transfer of all the funding set aside for the National Housing Trust Fund (HTF) in FY 2016—an estimated $133 million— to the HOME program in order to account for a 15 percent reduction in the appropriation for HOME. Although the Committee voted to maintain HOME funding at the FY 2015 level of $900 million, 85 percent of this amount ($767 million) will be directly appropriated for the program while the remainder will be transferred from the HTF, which was finally being capitalized after a long delay. This transfer puts the HTF at risk because the bill forbids Congress from putting any other money into the HTF following the transfer. The capitalization of the Trust Fund would have supported the expansion of rental housing targeted at households with extremely low incomes (up to 30 percent of Area Median Income), the first new production program aimed at this group since the creation of the Section 8 program in 1974. 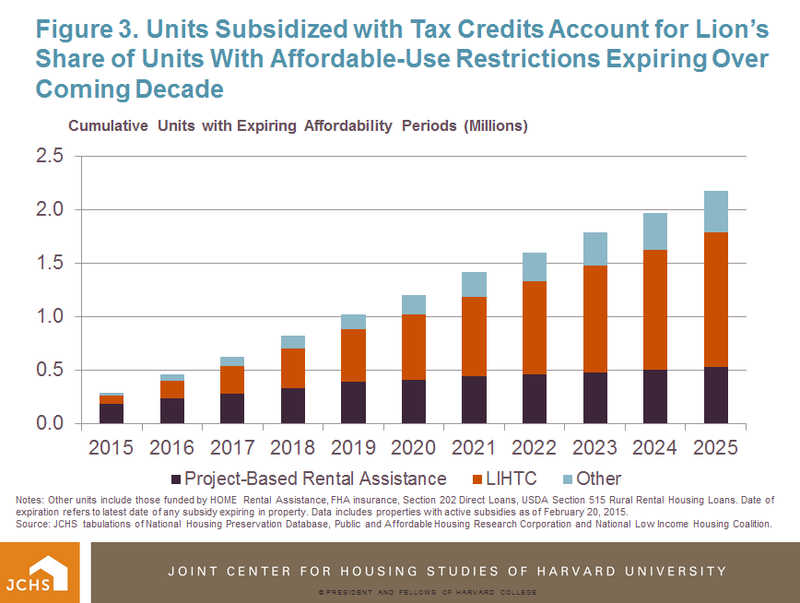 Existing affordable housing production programs like HOME and the Low Income Housing Tax Credit (LIHTC) program have higher income-qualifying limits than those established by the HTF, with income eligibility capped at 80 percent of Area Median Income (AMI) for HOME and 60 percent of AMI for the LIHTC program. In order to make tax credit units affordable to extremely low-income tenants, units in these properties often require layering of additional rental subsidies in the form of vouchers or project-based assistance, according to a 2012 report from NYU’s Furman Center. Furthermore, while state housing finance agencies—the entities responsible for allocating housing tax credits—may provide incentives for developers to set aside a certain portion of LIHTC units for extremely low-income households, HOME does not provide any specific set asides for the lowest-income renters. Unlike HOME and other federal housing assistance programs, the HFT was created with the intention that it would provide a predictable pool of funding not subject to the uncertainty of annual appropriations. 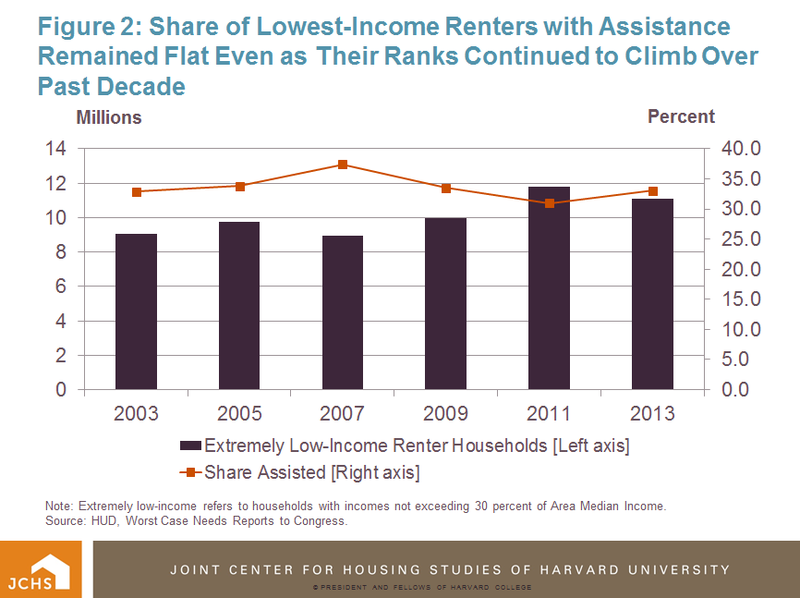 The potential elimination of the NHT in the current House appropriations bill comes at a time when the need for housing that the lowest-income renters can afford has never been greater. 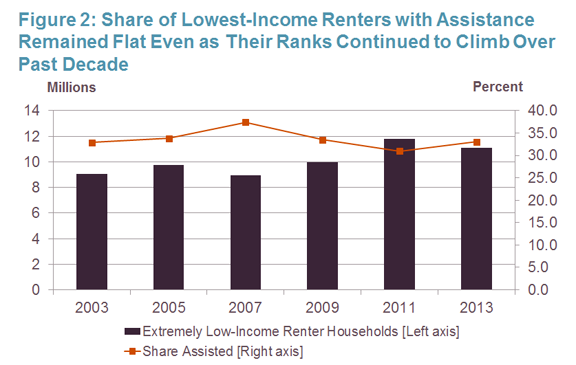 Rental assistance enables households with the lowest incomes to access safe, decent, and affordable housing by making up the difference between private market rents and what these families can afford to pay. Yet the capacity of federal, state and local governments to provide aid continues to lag behind a growing need. HUD’s latest Worst Case Needs report estimated that while the share of those with assistance has remained essentially unchanged from a decade ago, with a third of eligible households receiving rental assistance in 2013, (Figure 2), overall numbers of extremely low-income renters have increased by 22 percent over the past decade, from 9 million in 2003 to 11 million in 2013. Note: Extremely low-income refers to households with incomes not exceeding 30 percent of Area Median Income. Source: HUD, Worst Case Needs Reports to Congress. In this tight budgetary climate, the preservation of the existing subsidized stock in the private market, especially those units assisted through the LIHTC program, remains a key part of addressing the housing affordability crisis over the coming decade. Although the LIHTC program has higher income-qualifying limits than public housing or other rental assistance programs, a recent HUD report noted that a sizable share of LIHTC households—46 percent—have extremely low incomes. Tabulations of the most recent data from the National Housing Preservation Database show that over 1.2 million (58 percent) of the nearly 2.2 million total federally assisted units (excluding units subsidized through housing choice vouchers and public housing units without additional project-based rental assistance) with affordability requirements expiring between 2015 and 2025 are subsidized through the LIHTC program (Figure 3). 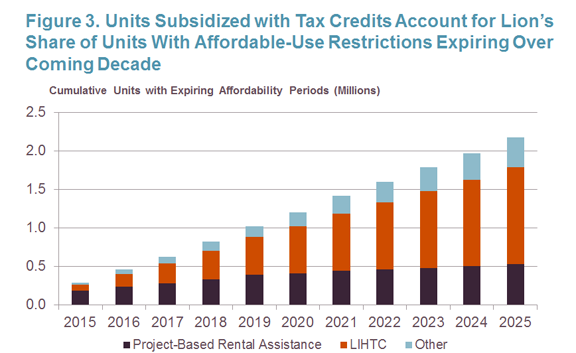 As I pointed out in a previous blog post, units subsidized through the LIHTC program are at lower risk of being removed from the affordable stock and most continue to operate as affordable housing without new subsidies even when tax credit properties reach the end of their affordable-use compliance period. Recent HUD initiatives such as a pilot program to expedite approvals for the purchase or refinance of LIHTC properties through FHA’s Section 223 program will also help preserve the affordability of existing tax credit properties, with estimated lending for FHA-insured LIHTC projects doubling from roughly $900 million to $1.8 billion last year. Notes: Other units include those funded by HOME Rental Assistance, FHA insurance, Section 202 Direct Loans, USDA Section 515 Rural Rental Housing Loans. Date of expiration refers to latest date of any subsidy expiring in property. Data includes properties with active subsidies as of February 20, 2015. Source: JCHS tabulations of National Housing Preservation Database, Public and Affordable Housing Research Corporation and National Low Income Housing Coalition.